Today we are focusing on any individuals who have their Jupiter in Libra in their birth chart or Jupiter in the seventh house. If either of these applies to you, you will search out partnerships based on equality, fairness and honesty. You may be attracted to people who are open minded, love to travel and enjoy the outdoors. You would love an honest debate and are open to other people’s opinions. You would often bend over backwards to help others. You may find that you actually sway a little too much towards pleasing others and have a hard time taking sides when you get into heated discussions. This is due to the fact that you want to be everything to everyone and hate confrontation and discord. There is great opportunity with Jupiter in the sign of Libra, as Jupiter will add good fortune and good luck to life’s events, particularly when it comes to your associates, your lovers and those you wish to get close to. Justice and a great sense of morality are strong character traits aligned with Jupiter in Libra. You may also be able to sway others to take the moral ground and like to make amends after an argument. Marriage and close personal relationships are extremely important to you and your objective is to treat everyone fairly and offer friendly advice to those in need. You need a partner who is intellectual and open. Your partner should enjoy sporting activities and traveling. You need the wide open spaces and having a walk with your loved one or a close and personal friend in nature would be something that not only suits you but conforms to your gentle nature. Part of your life’s purpose is to cultivate relationships of substance, treat people fairly and create harmony and peace in your environment. You are diplomatic and courteous, and the legalities of life are important to you. When transiting Jupiter moves into the seventh house, you may find that important relationships are formed or brought into focus. In general, Jupiter transiting through the seventh house offers opportunities to expand a current relationship and enhance the potential for making the relationship more significant in your life. 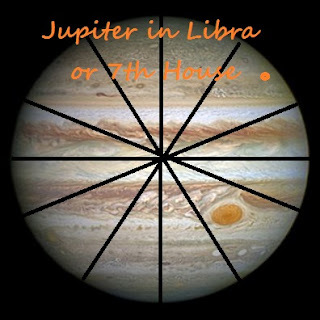 With this house placement, you may find that you are more helpful and courteous during the year or so that Jupiter transits this house, especially when it comes to relationships or social interaction. If you are experiencing legal issues, this is often a good time for mediation and justice. Legal advice can do wonders if you are in need of counsel. However, it is important that justice prevail and if you are searching for something that you do not deserve, you may be disappointed. It is important to see what aspects transiting Jupiter may be making to other planets in your chart to get a clear more full picture. If, for example, natal Jupiter is in the ninth house and sextile to transiting Jupiter, the opportunity for a favourable outcome is increased. But if Saturn is somehow involved in this configuration (particularly if it is by a challenging aspect) make sure that you are doing the required ground work before you move forward. Ensure that you have all legal obligations in place. Saturn will challenge the outcome and make things difficult. It is not unusual for Saturn, if involved, to cause delays in the final outcome but the outcome could be most fulfilling.